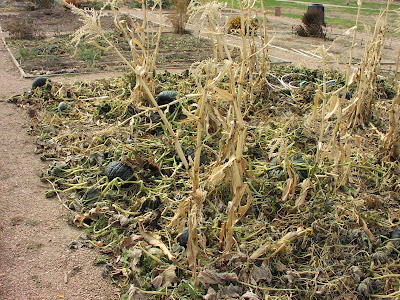 Our community garden patch looks a bit sad now that Winter is approaching fast. Time for the final clean-up! 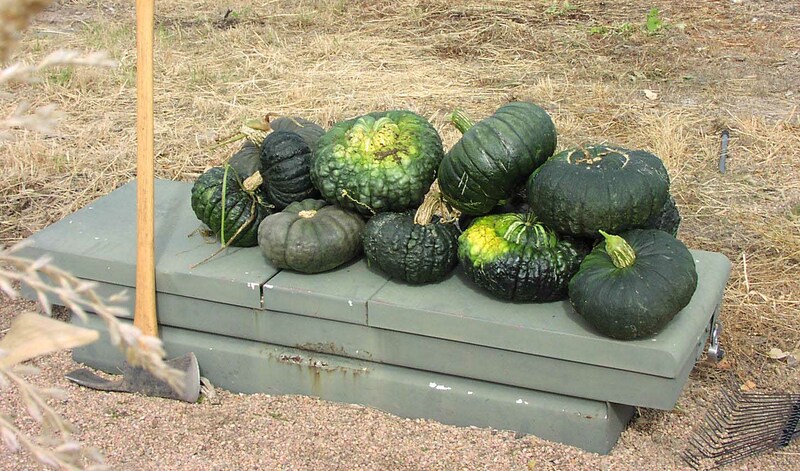 The dads went and harvested the last of our squashes this past weekend. We are happy to report a total of about 20 Zucca Baruccas. We have yet to make the famous ravioli recipe from Marcella's Cookbook. Why? Because we cannot find Amaretto cookies in this town nor anywhere near here. Stan must have visited every grocery store, natural and unnatural, in a 100 mile radius. No luck! DH says we are silly. Why be such slaves to following a recipe to the t.
So for now all that is being served is Pumpkin muffins, pumpkin pie, pumpkin gnocchi. They must put those cookies on the shelf for Christmas soon? Or will we break down and cheat on the recipe? 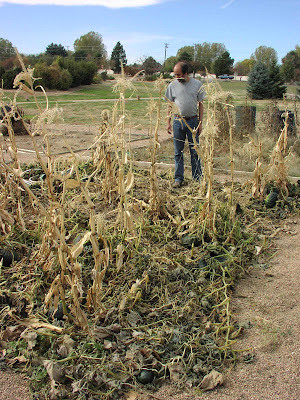 It is a sad thing to have to say goodbye to all the plants that gave us such good food over the warmer months. I am pulling up my tomato and basil plants this week too. Lola was sad to see her special cherry tomato plant all withered and droopy. But i promised her 3 cherry tomato pants all to herself next year, and that made her happy again! We got so many weeks of extra growth though this year...It kind of freaked me out having tomatoes end of October! I suppose global warming has some advantages. Good thing to promise new plants for next year! I will look forward to them, too! I am sad, yet glad the garden is almost done! We also were eating tomatoes last week, very strange indeed. We are still getting kale, carrots, leeks, parsley and brussel sprouts. It was cold this week! Our brussel sprouts never got big this year. Do you have any tips on how to grow them?